To celebrate the 50th anniversary of Cambridge researchers Alan Hodgkin and Andrew Huxley, receiving the Nobel Prize for explaining the electrical nature of how nerve cells work, Cambridge is hosting a special neuroscience conference. Top scientists have travelled from around the world for the event, and we've got some of them here with us, as well as Dervila Glynn, the conference organiser. Hannah - We have Dervila Glynn who is the conference organiser. So Dervila, I believe that Alan Hodgkin and Huxley, they used a particular species in order to understand the electrical properties of the nervous system. They used squid, why? Dervila - That's correct, Hannah. Simple reason really. What they were studying was the axon or the actual nerve. The simple reason why they used squid was because of its size. So, an axon or the nerve that they were using in squid, it can be measured up to 1mm and they are generally about 0.5mm which is quite big when you consider that a human's is about a thousand times less than that. So, for the practical reasons: they could actually insert electrodes into these axons and measure the electric potential; obviously, they were quite plentiful in the Atlantic; and also, they were able to manipulate the cytoplasm - the salt contents. So, the sodium and potassium, and that's how they were able to measure the voltage in there. Dervila - No. Well, in fact actually, they started their experiments in Cambridge in 1935 and in 1939, they released a short paper in Nature, just before the outbreak of war. They both went and then worked in the war. They didn't get back together until 1945. So, they worked in Cambridge, but they also did a lot of their work at the Marine Biological Association Laboratory in Plymouth. That's actually where all the trawlers came in and they got their squid there. Hannah - And so, they put this wire down the squid's nervous system and then measured that there was electricity that was flowing down this nervous system and that's how they found out that - how a nervous system, in order to control our thoughts and also, in order to allow us to move, uses electricity just like houses. Chris - What did people think before that then, before we knew that the squid actually were electrically conducting? Do we know what the prevailing wisdom was? Karl - Well, this is Karl Deisseroth and you've heard my introduction already, but people knew that electricity was involved for a long time before that. People knew that you could stimulate with electrical shocks and get some movement. The genius of the Hodgkin and Huxley was to figure out exactly how the communication happens, what the currency of information flow in neurons actually was. It was this beautiful event called an action potential which is generated by sodium channels and potassium channels that work together in a beautiful pattern. And only by working with the squid could they do this. Hannah - So, it's the sodium and the potassium, because they're charged ions, because they've got a particular charge on them then they carry a charge and they carry current. That's how they worked out that we can control our thoughts and use thoughts in movement and in the nervous system. So Dervila, you've got this conferences coming up in the next 2 days. What's this conference about? Dervila - So, this conference really is about 2 things. It's celebrating the award and celebrating Hodgkin and Huxley, but it's also really about their legacy. All of the speakers that we have speaking are doing work that has relations to ion channels, and that's really the big significance of Hodgkin and Huxley's work. So, there'll be people talking about ion channels in respect to all different types of diseases. And so, it's relating the work that they won a Nobel Prize for 50 years ago and how it's actually come forward and how all these important findings - because it's pretty much one of the most important findings in neuroscience. But how it's really translated today. So, there'll be people talking about pain, stroke, multiple sclerosis, Alzheimer's, and also about the basic biology of these ion channels as well. Hannah - That's brilliant! Thank you, Dervila Glynn from Cambridge Neuroscience. Frances - Perhaps we should just explain what an ion channel is because the important thing about ion channels are that they conduct ions. They're like ions like sodium and potassium - common salts - to go through them. But they're nothing more than tiny little pores that sit in a membrane that surrounds every one of your cells, not just the nerve and muscle cells, but all cells in the body. The most important thing about them is that they can open and close. When they're open, the ions can go through and when they're closed, they can't. Because the ions flow from a high concentration to a low concentration, they also carry an electric current and that's what is responsible for generating the electrical impulses. Hannah - So, it's almost like these ion channels are a door that can be opened and closed, that allow charge to go in and out, and that allows electricity to flow. Frances - I think the important thing to remember is that in living systems, electricity is carried by ions. The currents are carried by ions whereas in the wires that run through your house, they're carried by electrons. So, this is somewhat of a difference. 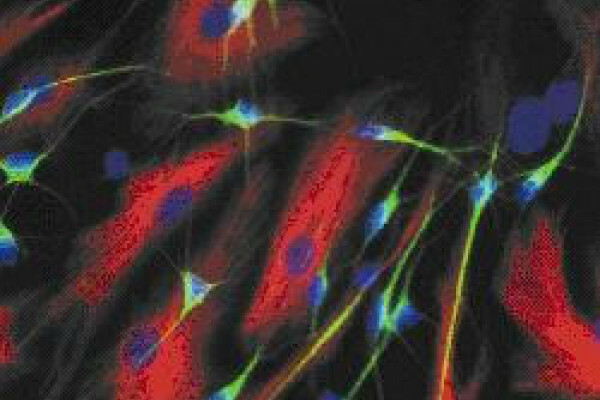 Previous How Do Nerve Cells Signal Pain? Next Can TV programmes change your accent?